The countdown begins for one of the most important wind power events in the world, China Wind Power. We are happy to announce that HINE will be sponsoring the conference and exhibition, which will be held from 17-19 October 2018 in Beijing. China Wind Power was first launched in 2008 and enjoys an extremely high reputation in the industry with an ever-expanding size year by year. More and more wind power enterprises, experts, and component manufacturers have joined the exhibition during the last years. 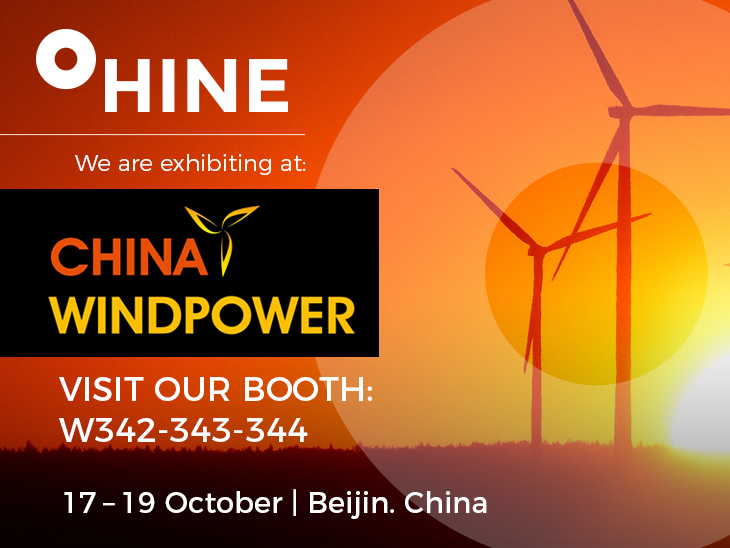 China Wind Power is well connected to the industry and as a leading supplier in hydraulics, HINE will be there showing its capacity in hydraulic systems, components and cooling systems for wind turbines. HINE will have an active participation during the conference. Alberto Frauca, Head of Wind Energy at HINE, will offer a keynote on Thursday, 18th of October at 11:00 AM where he will analyze the efficiency between two key hydraulic systems in a wind turbine, Hydraulic Pitch and Electric Pitch. The presentation will take place at W101 auditorium and as proud participants, we invite you to join us. You are also warmly invited to visit us at booth W342-343-344.